The concept of chasing after God seems pretty simple. I mean, it's just another way of saying that you're seeking him right? Just a more dramatic, more passionate use of words. This is true but chasing after God also implies a much more intentional action. You have not just a definite goal in mind, but you also need to have a strategy for getting there. Think about a bunch of children playing tag or some similar game. The person who is "it" will only catch someone if they focus on one person and chase them. If they try to chase several people at once, they won't catch anyone, because after a while the various people that they are chasing will separate, forcing the catcher to choose one person to pursue, or risk catching no one. It's the same with our pursuit of God. We have to choose to be intentional about pursuing Him. Jesus tells us this when he says no one can have two masters, because he will hate one and love the other. In short, it's impossible, we have to choose. But why chase God anyway? Is God moving away from us? Not at all! But there are many many things that try to get between us and our Saviour. They pull us away from Him; they stand between God and us; they obscure our vision of Him. We chase God, because the natural course of life pulls us away from Him, like the tide pulling us out to sea. 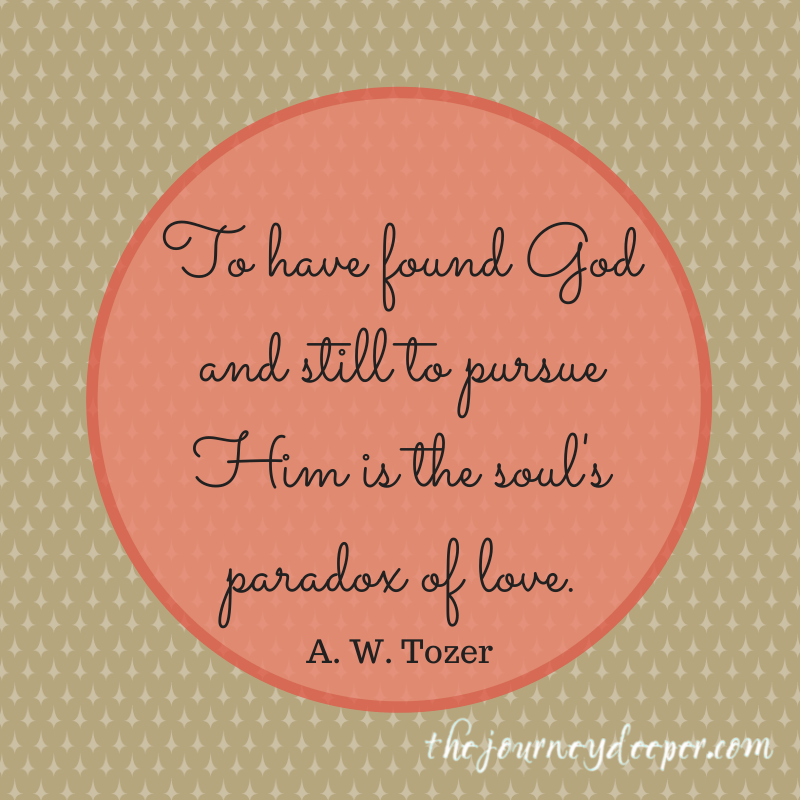 We chase God, because in pursuing Him, we want Him all the more. We can only cling to one thing in the ocean of life, we can only chase one thing in life's game of tag. It may seem like we can have God, and still have all the other things that we want to pursue, but the truth is, in our pursuit of God, and God alone, the prize is much greater than anything we could possibly achieve in our own selfish pursuits. The fulfillment of "catching" God is much more than the fulfillment that comes from "catching" anything else. If so, tag! You're it! Be blessed and shine in pursuit of Him! I LOVE the illustration of tag - and how we can only catch what we are focused on. I needed this reminder this morning! I'm so glad that this spoke to you! And it's so amazing what we can learn from the trivial things in life!